Not really all the things but all of the tomatoes. In an effort to continue our family commitment to healthy living we have stopped using most canned goods. That sounds crazy right? That isn't to say that I NEVER use canned anything, but I am really picky about the brands that I use and they types of things that we will eat from a can. You see, most cans use nasty chemicals in their linings. Tomatoes in particular are bad because the acidity breaks down the coating on the can. I won't go into detail because there is a ton of literature out there. Yuck. We also have access to AMAZING tomatoes from our CSA. The wonders of our CSA are a topic for another time. Soooo long story short, we preserve our own. And by "we", I mean the hubs. He is completely into kitchen technology. I think the nerd in him likes to play with all of the toys. Anywhoo, a couple of years ago I gave him a heavy duty pressure cooker by All American. This thing is a beast and probably weighs 20 pounds. Honestly, it scares me to death, but the results are amazing. It can cook a roast in about 10 minutes, a whole chicken in 10-15 minutes, and holds 7 quart jars at one time for canning! The first step is blanching the tomatoes. After blanching and an ice water bath they are skinned and deseeded. We haven't always done this because we don't mind the skins, but the kids seem to like it better without skin. We have played around with making sauces and salsa, but have decided that it is better to just have the canned tomatoes. That way my hubs doesn't spend all day cooking and we have more flexibility with the end product. 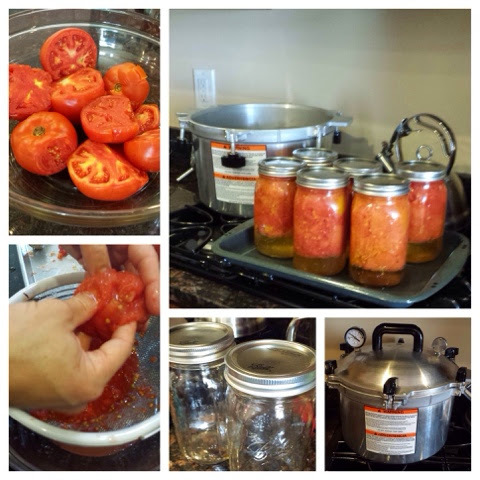 The tomatoes are then packed into mason jars with two tablespoons of lemon juice per quart. This is sounding easier and faster than it is. Make no mistake, this is about a three hour evolution. Especially with kids...everything takes longer. After the packing, into the pressure cooker they go! The pressure cooker gets screwed down, and it cooks for ten minutes at ten pounds. That's it! They cool off and get stored for winter. I have summer tomatoes to add to soups, stews and recipes!